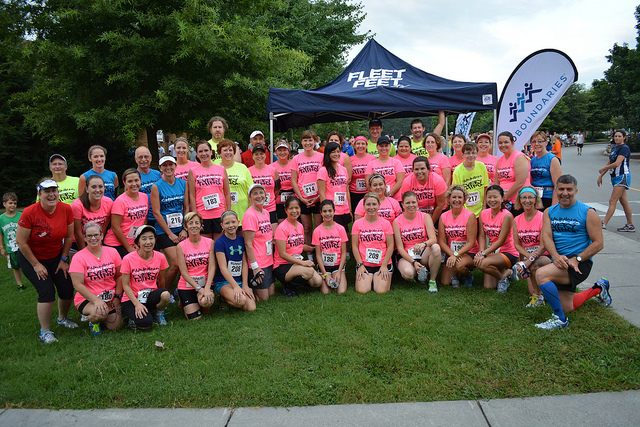 On August 10th, Fleet Feet Knoxville's No Boundaries group in conjunction with Maryville Parks & Rec, set out to conquer the Scholar's Run 5K! Prior to the race, the group met each week for 10 weeks and trained on the beautiful greenways of Maryville with their coaches encouraging them through the sweat and sometimes tears. Mile after mile the group conquered to prepare for the big day. Once race day finally came, the NoBos joined over 400 other runners and walkers for the Scholar's Run at Maryville College to cross that finish line. Coach Sally reported "Although the humidity made our run feel a little more like a swim than a run - it was a great 'graduation' fun run!!! I am blessed to be able to help coach others to a goal - the next class will start soon, hope to see many old and new faces there! It takes more than sweat and aches to finish a 5k - it takes determination, dedication and a true belief that Running Changes Everything - and there are No Boundaries that can stop us!" We are so proud of not only our runners but also our coaches. You are all dedicated and it makes us so happy to see you accomplish your goals. We can't wait to train with you again. Reindeer Run, here we come!